Amos was signed as an undrafted free agent by the National Football League’s New York Giants on May 3, 2017. Amos attended training camp and was waived on Sept. 2, 2017. 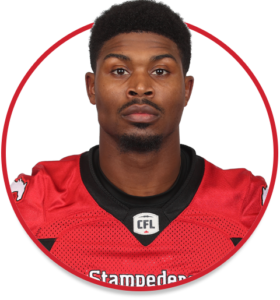 (Calgary) Amos played two games for the Stamps after signing on Oct. 3 as he started at halfback against BC in Week 18 and at cornerback in Week 20 against Winnipeg. Amos had a total of 10 tackles and one knockdown. Amos played four seasons (2013-16) at East Carolina. In 49 career games for the Pirates, he had 116 total tackles including 5.5 tackles for loss, two sacks, one interception, two fumble recoveries and 11 pass breakups. His interception came against Tulsa during his freshman season and was returned 100 yards for a touchdown. Amos was a versatile player for Manchester High School in Midlothian, Va., seeing action as a receiver, defensive back and kick returner. He scored 12 touchdowns during his senior season – five on offence, five on special teams and two on defence. Amos also played baseball and basketball at Manchester.